When you start thinking the world is out to impress you, and not the other way around. Things suddenly fall into place. 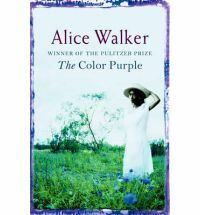 Alice Walker must have had a backbone of steel and a pen that won’t stop to have written this saga. The Color Purple has been interpreted in so many ways by so many people. Some call it the story of human spirit, others a tribute to all women. But to me it represented relationships, friendship, sisterhood and how sometimes you don’t even need to be related by blood to feel empathy. The story starts off on a terrible note, raped and abused by her own father, rejected by her mother, Celie is brought up surrounded by injustice. The parts of the book where she is pain with labor bearing her own father’s children was too painful even to read! She is ashamed of herself, a typical psychological trauma that all victims of childhood sexual abuse feel. And yet, through all the pain, her one priority in life is to fight for her sister Nettie. She prays to God Nettie is not bought by a Mr.——— (She never mentions his last name almost yelling out his insignificance) and is almost glad she is trapped into marriage with him. Through all the torture from her husband, her ungrateful children,she has but one thought and prayer, that Nettie comes out of her house safe away from abuse and away from shame. But the book has many more layers, it’s not just a story of long lost love finding itself, but that of motherhood, sisterhood, friendship, love and most importantly the freedom to be able to love and pray as one wishes. God is an interesting concept in the book. For Celie, god is a bad dream who sits there takes in all and does nothing but the entire concept of an untrue god changes in the book. “I think it pisses God off if you walk past the color purple in the field somewhere and not notice it. What did it do when it pissed off? I ast. Celie wins you over with her simplicity and innocence; Shug with her passion, energy; Sofia with her strength and Nettie with her perseverance. Each character in the story has been written with an innate human quality. Yes, it is about the triumph of a woman’s spirit but it’s also about finding the silver lining when there is no hope. It’s about holding on to those we love and keeping promises. It taught me one thing, that Life is what we make of it. Lovely book, a must read for those who dream of a bigger better life! 🙂 Love you Alice!